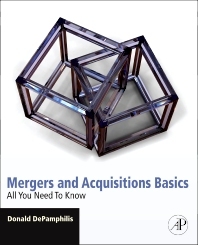 Mergers and Acquisitions Basics: All You Need to Know provides an introduction to the fundamental concepts of mergers and acquisitions. Key concepts discussed include M&As as change agents in the context of corporate restructuring; legal structures and strategies employed in corporate restructuring; takeover strategies and the impact on corporate governance; takeover defenses; and players who make mergers and acquisitions happen. The book also covers developing a business plan and the tools used to evaluate, display, and communicate information to key constituencies both inside and outside the corporation; the acquisition planning process; the negotiation, integration planning, and closing phases; financing transactions; and M&A post-merger integration. This book is written for buyers and sellers of businesses, financial analysts, chief executive officers, chief financial officers, operating managers, investment bankers, and portfolio managers. Others who may have an interest include bank lending officers, venture capitalists, government regulators, human resource managers, entrepreneurs, and board members. The book may also be used as a companion or supplemental text for undergraduate and graduate students taking courses on mergers and acquisitions, corporate restructuring, business strategy, management, governance, and entrepreneurship. Students and professionals around the world who are studying or working in mergers and acquisitions. The book is especially useful for readers who seek material that lies between intensive and superficial coverage of these subjects. It requires only passing acquaintance with finance, economics, business law, and accounting. Do Mergers and Acquisitions Pay Off for Shareholders, Bondholders, and Society? What Makes the Aggressive Approach Successful? Donald M. DePamphilis has a Ph.D. in economics from Harvard University and has managed more than 30 acquisitions, divestitures, joint ventures, minority investments, as well as licensing and supply agreements. He is Emeritus Clinical Professor of Finance at the College of Business Administration at Loyola Marymount University in Los Angeles. He has also taught mergers and acquisitions and corporate restructuring at the Graduate School of Management at the University of California, Irvine, and Chapman University to undergraduates, MBA, and Executive MBA students. He has published a number of articles on economic forecasting, business planning, and marketing. As Vice President of Electronic Commerce at Experian, Dr. DePamphilis managed the development of an award winning Web Site. He was also Vice President of Business Development at TRW Information Systems and Services, Director of Planning at TRW, and Chief Economist at National Steel Corporation.